This age of technology promises one can live anywhere and work on-line. Well, that works until the small-town Internet monopoly goes down. After over twenty-four hours of no Internet access and communicating with the no information customer service reps multiple states away, I’m starting to feel a little testy. To help with this, I spent yesterday working on a solid article about planning your tea party menu. Please look for it ASAP~for the moment Internet access returns, I will post it. On the other hand, two new teas arrived in the mail Thursday night and I already sold out. Customers request the heavily flavored blacks all the time. Sometimes I feel I am selling them the equivalent of the Bartles and James wine coolers of my youth~heavy adulterated flavors of the basic ingredient so the quality of the original content doesn’t matter. But then I realized in this mocha-chino Starbucks world, the flavored teas often bring in those who thought they always disliked tea before. What’s your opinion of flavored teas? I am not a big fan of flavored tea. But I do like mixing tea here and there for example rose with cyrhsanthemum and apple flower. Herbal blends rather than artificial flavoring. Lately I am drinking a lot of yunnan red tip and yunnan tippy both from http://www.teacuppa.com Iced black tea with milk and sugar! Thanks for stopping by and your comments. 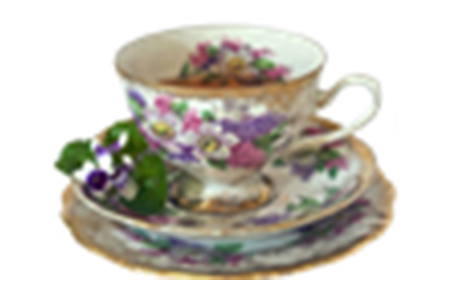 For my readers~you might want to follow the TeaCuppa link and see their Tea Library/Tea Articles. One in particular talks about determining a tea’s quality. I think flavored teas are lovely and fine as long as they are flavored with the essence of natural things. No sprayed-on, lab-produced chemical imitators, please! While I gravitate toward the non-flavored, I do enjoy the flavored teas when the mood hits…especially iced! Plus, flavored greens (think Jasmine) are very traditional. Addendum to my last comment…. I realize that Jasmine teas are actually scented – not flavored – with the Jasmine flower. (And not all Jasmine teas are green.) However, I think the aroma of a “flavored” black tea is actually the most potent part. It’s the armoa the generally allures me – the taste is often quite meek in comparison. Anybody else have that experience? Interesting comments, Steph. Yes, the smell is an integral part of the experience, for sure. Two of my local best-sellers are an Almond Black and a Creme Brule’ and they smell incredible. Unfortunately, the Creme has artificial flavors, but it’s been requested so often, I’d be crazy to continue to say no to my best customers. I love all teas…straight, blends, scented, and flavored. I started with flavored, and I still keep many flavored teas on hand simply because I *like the flavors*. I’m particularly fond of fruit flavored teas (ginger peach being way up there on the list), and hazelnut teas. I love chai blends as well, with milk and sugar or honey. Chocolate teas are my favorite flavored teas, I think, and I have a favorite Cranberry Blood Orange for icing, as well as a very fruity blend that ices well too. Fruit flavored white teas are lovely too, if not over or under done. I sort of equate having a palate with the ability to enjoy many tastes as far more versatile and desirable than a scope limited only to “original” tastes, whether that be in food or drink. Just because something isn’t “original” doesn’t make it better or worse, and I’d hate to limit myself and possibly miss out on something wonderful through a misplaced sense of what I “should” enjoy vs. what I actually “do” enjoy, if you know what I mean. Hi Jamie, what a great perspective. Hazelnut…yum. Be sure to check out Jamie’s blog, Tea on Tap (address in sidebar, still learning html). She’s always reviewing new teas and full of great suggestions for learning what we might enjoy in the world of tea.